Mr Turner opens on a sun-blushed windmill and on milkmaids giggling and gossiping as they carry their pails. They make way for Turner himself, silhouetted against the sky and iconic from the outset, with his top hat, sketchpad and portly frame. It's a fine opener promising a work of great beauty, wit and poignancy; luckily, that's just what writer-director Mike Leigh delivers. 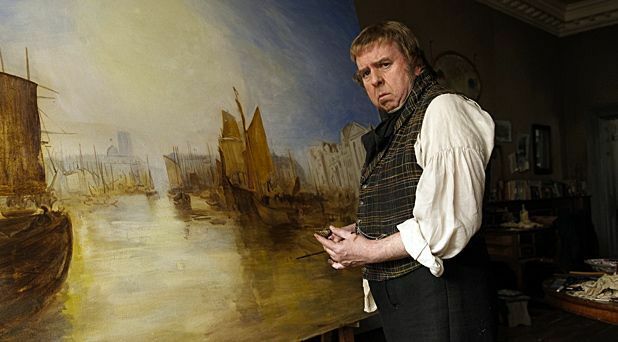 Timothy Spall (nose aloft and irritated as if he's permanently experiencing a bad smell) is Joseph Mallord William Turner in a film documenting the last quarter-century of the painter's life. Although unapologetically gruff, he's presented as a sharp blade slicing through society's buttery pomp and grotesque pretension. Through scenes set in the Royal Academy where we see Turner prowling about appraising the work of his rivals, the film illustrates how art can be about competition as much as expression. His relationship with Constable is amusingly reduced to a growl (from Turner) and a strop (from Constable). The dialogue, like Turner himself, strikes a deft balance between baldness and poetry. Leigh's approach is characteristically bold, while Spall makes a sympathetic, spectacularly eccentric Turner. It's a film that heaves with emotion, revealing the pain Turner endures from artistic derision and personal loss, without shying from the hurt he inflicts on his loyal housekeeper (Dorothy Atkinson) and abandoned mistress (Ruth Sheen). Leigh's latest boasts scenes to savour, and is rich with exquisite detail: the bleeding colours of the credits, Mary Somerville's experiments with light (a charming turn from Lesley Manville) and, best of all, the unbridled affection between Turner and his devoted 'daddy' (Paul Jesson). It's a funny, fitting, warts-and-all monument to a British master, with Mike Leigh demonstrating a command of his craft to rival even his subject. General release from Fri 31 Oct. Portrait of the last 25 years of the life of painter Joseph Mallord William Turner (Spall). A work of great beauty, wit and poignancy, presenting the artist as unapologetically gruff but sympathetic and spectacularly eccentric. Leigh's latest demonstrates a command of his craft to rival that of his subject.